My husband came home from Whole Foods and let me know they were having a fresh cherry recipe contest. “I want to win!”, I optimistically replied. I put some thought into the recipe. The obvious direction felt like chocolate (who doesn’t love chocolate covered cherries?) But I thought about Iron Chef and how they might say the secret ingredient should shine. I felt like the whole thing should be about cherries. Ice cream came to mind next, because I make and eat ice cream often … but cherry pie is my husband’s favorite (he has it every year on his birthday). So I put all three ideas together Ice Cream… chocolate chip… pie. Yes, I thought, I will win. So I did a few test runs, and let me tell you, I didn’t mind eating the results! Then I wrote up a beautiful recipe to send in (doesn’t it look lovely?) And waited for the results. I still pouted a tiny bit. After all, I did want to WIN. This dessert is surprisingly simple to make. Very little cooking technique is needed, but you will need to plan ahead due to the time required for cooling and setting. I recommend starting the pie the day before you plan to serve it. If you don’t have an ice cream maker you can still enjoy this recipe. Simply purchase vanilla ice cream (vegan or dairy) and mix in the pureed (3/4 cup)cherries and chocolate chips before filling the pie. Combine the quartered cherries, 1/4 cup agave, and amaretto in a medium sauce pan. Bring to a simmer, and then lower the heat to sustain a simmer for 10-20 minutes until the cherries soften and just begin to break down (stir occasionally). Taste for sweetness and add more agave if needed. Mix the cornstarch with 2 tablespoons of cold water, and then add to the cherries. Bring to a boil, stirring for just a moment, then remove from the heat and set aside 3/4 cup (for the ice cream) and put the rest in the refrigerator. Preheat the oven to 350 F. Prepare a deep dish pie pan or 8-inch cake pan with parchment paper on the bottom. Combine all of the crust ingredients together in a mixing bowl. Spread the sticky batter evenly over the parchment paper (this takes a bit of patience). Bake for 12-16 minutes until the crust is light gold and cooked through but still slightly soft. (Keep your eye on this as nut crusts burn easily.) After it has cooled a bit, place it in the freezer. In a large saucepan, combine the coconut milk, agave, and hazelnut milk. Heat on medium-high and whisk frequently until it starts to bubble. Reduce heat and simmer for 3–5 minutes. Add vanilla extract and 3/4 cup Cherry Sauce and chill in the refrigerator for several hours. Puree the chilled ice cream mixture in a food processor and then pour it into an ice cream maker (use according to the manufacturer’s instructions). Do not over-churn the ice cream; once it is the texture of soft-serve add the chocolate (allow it to mix in), and then transfer it to the prepared crust and chill in the freezer. 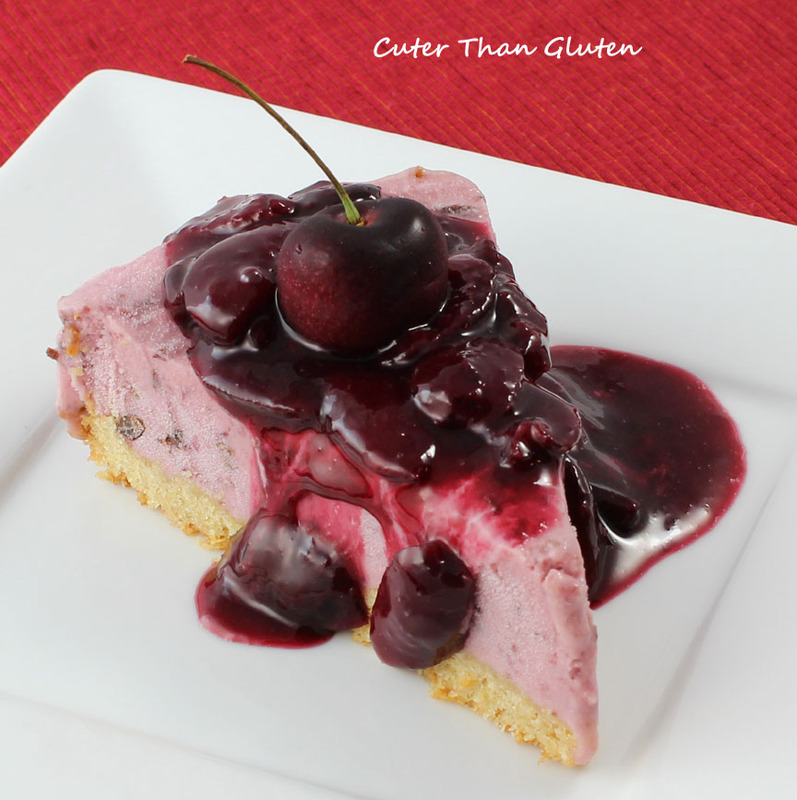 Once the pie is firm, serve slices with cherry sauce poured over the top and enjoy! 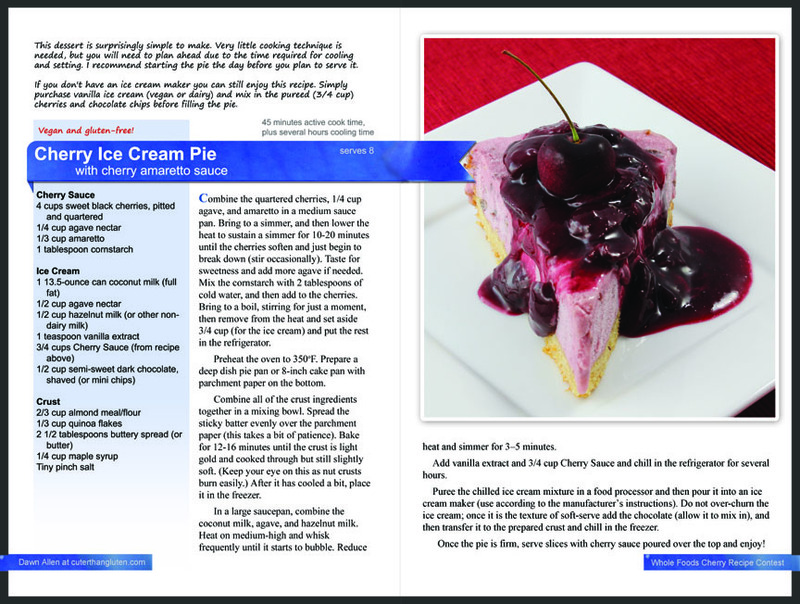 This entry was posted in Dessert and tagged cherry pie, contest, dairy-free, gluten-free, ice cream. Bookmark the permalink. Thanks for your comments and nice to hear from you. Sounds like fun- I will head over and check out your site. Oh, I breezed through the post too fast before commenting. You didn’t win the whole foods contest, but it was so much fun right?! Im sure your pie was a winner in your family’s eyes! Oh my goodness! The picture of your recipe caught my eye over at Wellness Weekend. YUM – and absolutely beautiful photo! You’re making my mouth water! I also host a linking party on my website on Fridays called Whole Food Fridays. I would love it if you shared this recipe – I would like to highlight it next week! Thanks! I will check it out, sounds like fun. PS. I have been following you blog for a while but didn’t realize it at first due to the name change… nice to hear from you! I am drooling over this ice cream pie! Wow-I could eat the whole thing right now it looks so good. 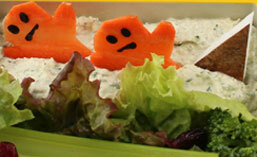 Thank you for sharing this fabulous recipe on Allergy-Free Wednesdays! This does sound amazing, what a shame you didn’t win! Thank you!!! With absolutely no previous gluten free knowledge, I made this pie for some family members and it was a hit! Even my dairy (and gluten) loving husband loved this pie! It was easy and so delicious, there was no feeling that it was a substitute for the “real thing”. Firstly, that cake looks so good I couldn’t help but check it out :) Secondly, you post so many super cute food ideas that I can’t stop exploring! Lucky kids to have such a dedicated mum and so many fun treats!